Ethics and fashion have been enemies for too long. Sustainable fashion however, has become a household term in recent years, with high street brands producing ‘fast’ or disposable fashion regularly critiqued for their negative impact on the environment and human rights infringements. For a long time if you wanted to jump on the sustainable fashion bandwagon, you had to fork out an arm and a leg for a white t.shirt, albeit a beautiful organic cotton t.shirt with no human impact. Brands like People Tree and Stella McCartney have been leading the ethical way for years, using eco-textiles and focusing on improving the lives of the often disadvantaged and exploited people producing the clothes. In March 2018, Stella McCartney represented the UK in the Commonwealth Fashion Exchange, an project conceived by founder of Eco-Age Livia Firth, wife of Colin. It brought together high fashion designers and local artisans from the Commonwealth’s 53 countries with a focus on sustainability, and the inspired by the environment around us. Livia Firth criticised the fast fashion industry in this morning’s news, citing the common use of slave labour in response to a new inquiry by the Environmental Audit Committee (EAC) that found that Amazon, TK Maxx and Misguided were among the “least engaged” in sustainable fashion and labour market initiatives. Environmentalists, vegans, feminists are often accused of losing support for their causes by being too preachy, and there is undoubtedly some truth in that however, some of the statistics speak for themselves. A report in 2018 by campaigners Wrap suggested that about 300,000 tonnes of clothing is binned each each year, not recycled, binned. That’s roughly 60,000 elephants worth of unwanted clothing. Documentary The True Cost travels around the world to the countries that produce most of our daily fashion to examine the human cost of fast fashion, asking “Who pays the price for our clothing?” The film highlights the impact of the realisation that countries could produce their wares for a fraction of the cost in less developed countries, and benefit from the lack of those pesky human rights laws. One example in the documentary shows how the demand for cotton in India has led to the creation of genetically modified cotton, and how farmers lose their land because they been priced out of their main source of income, leading to a steep rise in suicides. 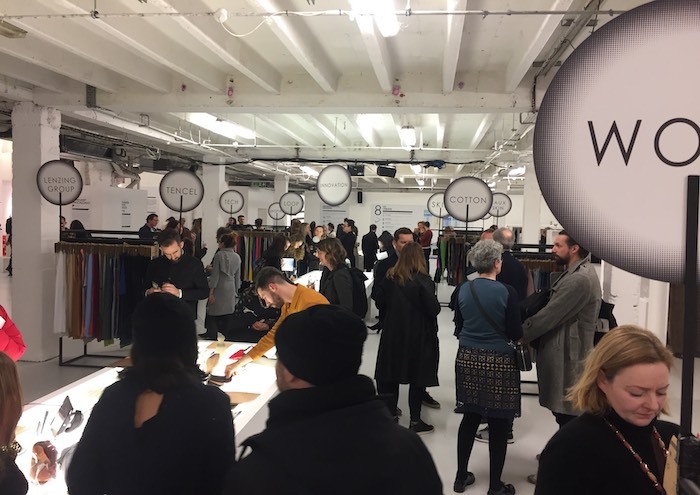 Last week saw the eighth edition of the Future Fabrics Expo, a showcase of inspired innovations in to low impact sustainable textiles and materials. The idea behind the expo was to create a positive fashion industry, working with safe and renewable materials and responsible practices throughout the fashion supply chain. 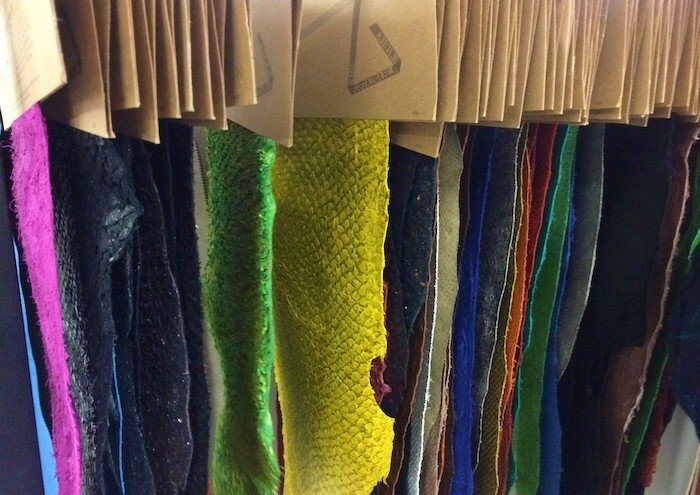 Impressive research has gone in to incredible innovations in material production including beautiful dyed leather made from fish. Icelandic company Atlantic Leather produce sustainable and eco-friendly material made from fishy products of the food industry. When tanning the skins no whale oil or cetaceans are used and no fish used by the company are an endangered species. Fish used include Atlantic salmon, Perch, Wolf fish and Cod and the results are stunning. Equally fascinating and inspiring was French company Printland, who produce beautiful patterned fabric made from 100% organic cotton, grown using a production system that replenishes the soil and uses no synthetic pesticides or fertilisers. The Sustainable Sequin Company also had on display their sequins made from bioplastic and their pioneering technology to create biodegradable sequins, so you can sparkle guilt free. 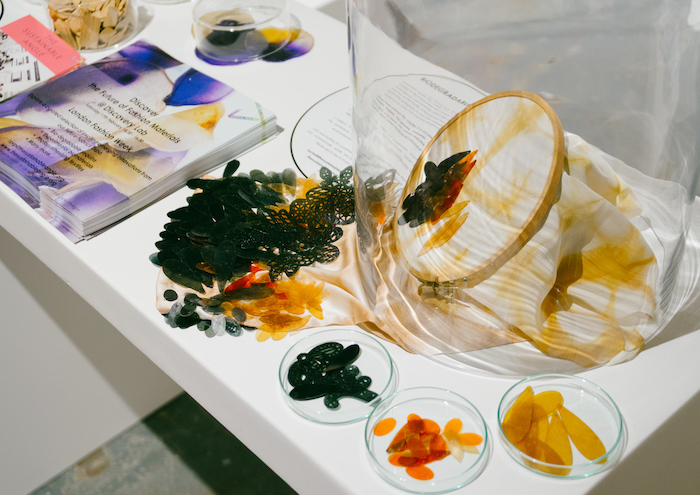 As well as bringing our attention to some of the most intelligent and creative advances in textiles, the expo also showcased individual designers making a dent in sustainable fashion. Mara Hoffman has committed her label to being at the forefront of changes in the fashion industry with a focus on using recycled and organic materials and ensuring the safety of the people producing her clothes. Dress made from Tencel, Mara Hoffman. These innovations, designers, and concepts are making it less and less possible for big brands to hide in the shadows. The more educated the public, the bigger the pressure on these companies to change. While brands like Stella McCartney and Mara Hoffman are to be congratulated for their commitment to ethical fashion, these innovations are often far from affordable. The fact remains that fast fashion is affordable fashion and icelandic fish leather, however amazing, will not come cheap. So if you can’t afford your Lem Lem dresses and your Veja sneakers, H&M launched their Conscious Exclusive range in April 2018 with dresses made from Econyl, a completely regenerated fibre made from fishnets and other nylon waste and silver jewellery made from discarded scrap metal. While this may not be enough to completely negate the elsewhere questionable ethics of a multi-billion pound company, it’s a start, arguably triggered by the efforts of leading smaller brands. Zara joined the sustainable game in 2016 with their Join Life Collection, championing the use of Tencel in their clothes, a material derived from wood sources from sustainably managed forests. These companies are still huge businesses with their own interests at the forefront of their actions, but these initiatives are a huge step forward for companies that for too long have had blood on their hands. Essentially, we should all be applauding these capable people of doing their bit for the world, and do whatever we can in the remit of our own abilities, to help them. If you’re interested in saving the planet with your face, read our feature on Chantecaille, the skincare and cosmetics brand devoted to protecting and preserving nature.